I was given this book for free for the purpose of review. The publication date is May 15th 2018. 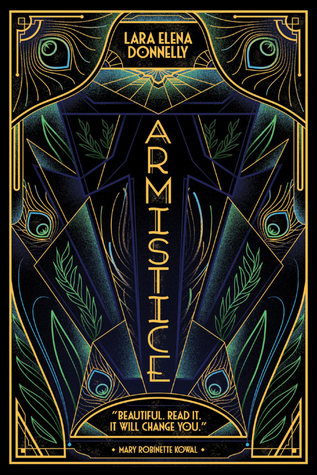 Book 2 of the Amberlough Dossier, ARMISTICE is the glamorous followup to the neon-lit and gritty book AMBERLOUGH. Where book 1 focused on the fascist take-over of the city-state of Amberlough, book 2 takes place in an entirely different nation with a thriving (and gloriously seedy) film industry. The art-deco infused setting has upped the glamour from the first book and added a distinct political tinge. Several of the main characters from the first book return. Cordelia, codename: Nellie, has become the terrorist leader of the Spotlight, a rag-tag group of unemployed entertainment industry professionals who lost their jobs when the ultra-conservative Ospies took over Amberlough. Aristede, once a drug smuggling burlesque theater owner and drag actor. He had to run for his life from Amberlough because of his deviant behavior. He fled to the film-district in a foreign nation, where he now lives a glamorous life as a tragic writer/director-in-exile from his homeland. Lilian dePaul is the sister of Cyril dePaul, a character from the first book. She’s reluctantly working for the Ospies because they have kidnapped her son and are using him to blackmail her. Plot: If the first book was a criminal-underworld book, this is a spy-thriller. I liked it. The plot revolved around a brewing civil war in a distant nation, with the Ospies are propping up one side while the royalists prop up the other. The different sides are busy backstabbing one another to get their way. It was very intrigue heavy and delightful. I liked all the characters, but particularly liked Lilian- which was surprising, given that she was a new character. I have a fondness for straight-edged characters forced to demean themselves. Pacing: It had a fairly slow start. I liked the slow burn, but I would understand if someone else didn’t like it. Constructive Criticism: Head hopping. The story’s narrative dipped into the thoughts of all the different POV characters when they were on scene together, the textbook definition of Head Hopping. It wasn’t as bad as it could have been, but it was distracting. Overall, I liked it almost as much as the first book- and the first book was in my top 5 books of the year. Highly recommended, but read book 1 first.